While a number of reviews of homeopathic clinical trials have been done, all have used methods dependent on allopathic diagnostic classifications foreign to homeopathic practice. In addition, no review has used established and validated quality criteria allowing direct comparison of the allopathic and homeopathic literature. In a systematic review, we compared the quality of clinical-trial research in homeopathy to a sample of research on conventional therapies using a validated and system-neutral approach. All clinical trials on homeopathic treatments with parallel treatment groups published between 1945–1995 in English were selected. All were evaluated with an established set of 33 validity criteria previously validated on a broad range of health interventions across differing medical systems. Criteria covered statistical conclusion, internal, construct and external validity. Reliability of criteria application is greater than 0.95. 59 studies met the inclusion criteria. Of these, 79% were from peer-reviewed journals, 29% used a placebo control, 51% used random assignment, and 86% failed to consider potentially confounding variables. The main validity problems were in measurement where 96% did not report the proportion of subjects screened, and 64% did not report attrition rate. 17% of subjects dropped out in studies where this was reported. There was practically no replication of or overlap in the conditions studied and most studies were relatively small and done at a single-site. Compared to research on conventional therapies the overall quality of studies in homeopathy was worse and only slightly improved in more recent years. Clinical homeopathic research is clearly in its infancy with most studies using poor sampling and measurement techniques, few subjects, single sites and no replication. Many of these problems are correctable even within a "holistic" paradigm given sufficient research expertise, support and methods. The popularity of complementary, alternative and unconventional medicine is increasing worldwide. Several surveys have estimated that between 30 and 70% of patients in developed countries use these practices, depending on the population and modality. [1–3] There is, however, a paucity of scientific research on many complementary and alternative medical (CAM) practices. A recent commentary in the Archives of Internal Medicine (vol. 156, pp. 2162–2164) called for more research into one of the most controversial of these practices, homeopathy, to determine its quality and clinical efficacy, putting aside for the moment its implausibility. Over the past several decades there have been a number of clinical trials on various forms of homeopathic treatment for a host of disorders from stroke and post-operative complications to arthritis and fibromyalgia to influenza and upper respiratory track infections. [4, 5] While the treatment and conditions studied vary, they share the common property of representing clinical outcome research on forms of homeopathic medicine. Several independent systematic reviews published to date on this research have all shown a surprising number of positive results, even among those trials that received high quality ratings for randomization, blinding, sample size and other methodological criteria. [4–6] None of these reviews, however, have looked at a broad spectrum of validity criteria and none have compared the quality of homeopathic research to conventional research using methods that were not derived from a conventional clinical diagnostic framework. These differing frameworks also complicate our ability to comparatively evaluate these systems. [7–11] The lack of support for homeopathic therapies among Western practitioners stems, in part, from the scarce quantity and perceived poor quality of homeopathic clinical research. However, no studies have directly compared the quality of research in homeopathic to conventional medicine using a quality assessment method that is neutral to their differing diagnostic classifications, treatment and outcome strategies. A meta-analysis of homeopathic clinical trials (on which WJ was the corresponding author) evaluated some specific quality parameters of 89 placebo-controlled trials of homeopathy using commonly used methods for addressing conventional medical studies. This study reported that homeopathic clinical trials scored about the same as conventional trials on the Jadad scale of quality assessment. The Jadad scale contains only 5 items, however, and measures simple components of internal validity. No information about external validity, generalizability, statistical validity, effects when compared to conventional treatments, and other important trial quality items were assessed. When doing this meta-analysis, it became clear to us that using review criteria based on diagnostic classifications developed for assessing conventional medicine did not address the differing classification frameworks between homeopathy and conventional medicine. There were practically no studies that addressed both classification schemes and very few that preselected a uniform set of patients according to homeopathic criteria before testing (as in the Fisher trial described above). This resulted in a heterogeneity problem, that is, we were mixing very different types of conditions and classifications but reviewing them from the perspective of one of these classification systems. This problem was not solvable by using narrow review criteria created for one (conventional) system. What was needed was a set of valid quality criteria that were neutral to these two systems with very different theoretical bases and approaches. We felt that an evaluation system called "Systematic Review" (SR) developed by Light and Pillemer  provided such an approach since the review criteria were not depended on diagnostic homogeneity and so address quite disparate frameworks. SR is comprehensive, objective and validated quality assessment method yet also with broad in applicability. It was originally derived and extensively applied to heterogeneous systems of intervention in the social, educational and behavioral sciences but has since been expanded to the evaluation of medicine – both conventional and complementary. [17–19] It allows for a comprehensive assessment of research quality across a variety of study designs and intervention areas. In SR, the methodological characteristics critical for attaining reliable and valid research results are evaluated across a variety of studies and study designs. By quantitatively evaluating components of research design, statistical methods, generalizability, bias and related findings, SRs provide an estimate of over 30 quality variables in a study set. Collectively, these criteria are referred to as "threats to validity." In addition to providing a comprehensive assessment of quality the systematic evaluation of scientific methods provides a framework from which future studies can be designed. In addition to its application in the social and behavioral sciences, SRs have been successfully applied to conventional and complementary medical approaches including nursing care , religion and mental health research , abortion , and physiotherapy. Because it provides an approach to the evaluation of disparate systems, we used the SR method to evaluate a sample of homeopathic clinical trials and compare them to the quality of research in conventional studies previously evaluated by the SR method . Our specific aim was to get representative samples of the "best" research in both homeopathy and conventional medicine and objectively evaluate their quality using a "system neutral" approach to research assessment. A multiple strategy search was undertaken to identify research on homeopathic treatments that used the strategy from the comprehensive review by Linde, et al. Briefly, this involved 1) the review by Kleijnen, et al. published in 1991,  which used a extensive search strategy for Medline and Embase up to 1990; 2) a direct search of Medline from 1966 to August 1995 using the full text terms homeop*, homoeop*, and the Mesh terms homoeopathy, homoeopathy, and alternative medicine and screening of all citations found; 3) contacts with homeopathic researchers, institutions reporting on homeopathic research, homeopathic manufacturers and follow-up on suggestions from these contacts; 4) searching several extensive homeopathic and complementary medicine registries including those of the Woodward Foundation (USA); CISCOM (RCCM, London); AMED (British Library); HomInform (Glasgow, Scotland); IDAG (Amersfoort, Netherlands); and CCRH (India) as well as several individual collections; 5) attending homeopathic meetings and searching the conference proceedings, abstract ebooklets, and indexes from meetings and homeopathic books; 6) the references of reviews and trials found; 7) and additional on-line searches of Medline and Embase from 1989 to October 1995. We operationally defined homeopathic research as studies involving serially prepared dilutions selected according to commonly used methods, including classical, clinical, and complex approaches including pathological and isopathic and tautapathic remedy selection. We sought to get representative samples of the best research in homeopathy and conventional medicine. There is a large disparity in the amount of research in conventional and homeopathic medicine. In addition, there are recognized journals in conventional medicine publish the best research, while this is not the case in homeopathy. We therefore used different approaches to identify the best articles in these databases as follows. For homeopathy, articles had to meet the following criteria: (1) use of a homeopathic intervention for a clinical condition in a comparative trial; (2) assessment of the outcome of the intervention using an empirical measure of some type; (3) be prospective and involve a parallel control group for comparison with homeopathic treatment; (4) have sufficient information reported for us to score with SR review criteria; (5) be in English. We included criterion (3 – studies in parallel control groups) because there is a vast literature of case and series outcome reports in homeopathy that are not written for purposes of research and so would not represent the "gold standard" for homeopathic research. Each article was reviewed using an established coding form previously used and validated for SRs to assess the characteristics and quality of empirical research. [19–21] In addition, we determined whether the primary study outcome (as determined by the author or, if unclear, selected by the primary reviewer) was improved, unchanged or made worst by homeopathic treatment. All articles were reviewed through a contract by a person specifically trained in the SR method, and has experience in applying it to a variety of study sets. This reviewer had no previous experience or opinion about homeopathy and was hired to apply the SR methods to this data set. In addition, the quality of these reviews were checked for reliability and accuracy on two samples by two other authors who have extensive experience with the SR method and were also neutral about homeopathy (RA and JL). All criterion are scored as either "met" if the quality items was present and adequate or "not met" if the quality item was either missing or inadequately met. The reliability of these review criteria was consistently greater than 0.95 between and among reviewers. Finally, we checked for trends in quality of the homeopathic literature over time by analyzing studies separately in three groups – those published before 1980 (n = 17), and from 1980–89 (n = 29) and 1990–96 (n = 13). Any indication of the reliability of any measure used. Any measurement or statistical applications that attempt to identify and control for variables that might influence outcomes independent of treatment. Rated as any groups < 10 or correlations with fewer than 30 pairs. More than 10 statistical tests without a Bonferroni (or similar) correction. Absence of effort to make measurements reasonably consistent. Repeated measures without temporal control on developmentally sensitive outcomes. Use of measures that are sensitive to the testing process. Use of poorly or uncalibrated measures. Evidence that selection into groups might interact with history, maturation, or testing. An association that can be interpreted in either direction vis-à-vis cause and effect. Contact between experimental and control subjects. Evidence that groups are knowledgeable about design and might Equal things out. Evidence that groups are knowledge about design and might compete with other group members. Evidence that one group feels disadvantaged through group assignment process. Evidence that choice of measurement operations does not represent the construct. Evidence that subjects might attempt to guess what results should be (absence of appropriate blinding procedures). Evidence that subjects might become anxious during assessments. Absence of controls to keep invested parties from participating in the measurement procedures. Failure to assess additional treatment received during study. Evidence that testing might be related to the treatment so that subjects complete tests differently after treatment. Evidence of a limited measurement approach that may not generalize. Evidence of a poorly chosen sample that does not represent the population considered. Evidence that treatment works only in some settings. Evidence that the time during which the study was done may have an impact on findings. Analysis consisted of descriptive statistics for both sets of studies and a comparison of outcomes in those studies randomized and blinded to those that were not using chi-square method. In addition, we compared the number and percent of "threats-to-validity" in both homeopathic and conventional data sets both individually and in their subgroups. A total of 59 empirical studies evaluating the effects of homeopathic interventions on clinical conditions were included. (Table 2) Forty-seven of these (79.7%) were articles published in peer-reviewed journals. Twelve articles (20.3%) were published as proceedings. The studies were published in 22 different journals, although 20 (34%) were from the British Homoeopathic Journal. Most studies (n = 50, 84.7%) indicate no funding support, although two (3.4%) were funded by a government agency and seven (11.9%) stated they were funded by a private donor/foundation. Across all studies that reported the gender of subjects, 60% of subjects were female and 40% male. Seven studies (11.9%) were entirely female samples while two studies (3.4%) were entirely male samples. Nearly half of all studies (n = 27; 45.8%) failed to report the gender of subjects. No study indicated the race or ethnicity of its sample. Thirty-nine studies (66.1%) indicated the national origins of the sample with only one study comprising subjects from the United States (1.7%) and 38 studies comprising residents of other countries (64.4%). The average sample size was 2,135; however, this high average results from a single study of 18,640. The median sample size was 59, with a range from 10 to 934 (excluding the outlier). Two thirds of studies (n = 40; 67.8%) had a sample size below 100. All studies were prospective and used a comparison group. Twenty-three studies (40%) used a placebo control. Thirty studies (50.8%) used random assignment between experimental and control groups while six (10.2%) used a matched control group. Forty-nine studies (83.1%) did not describe the sampling frame used, that is, they did not describe how the patient sample was identified. For example, one study described the method for random sampling, four studies used a systematic sample frame (e.g. consecutive cases), one study used a mixed frame (e.g. random sampling of consecutive cases), and four studies did not use a sample frame (i.e., convenience sampling). Most studies (n = 51, 86.4%) failed to consider potentially confounding variables in their designs such as open patient selection, severity of illness or non-blind measurement. Seven studies explored potential confounds and found none, while only one study explicitly discussed potential confounds in the design. The proportion of studies in which specific threats to the validity of causal statements were identified can be found in Table 3. 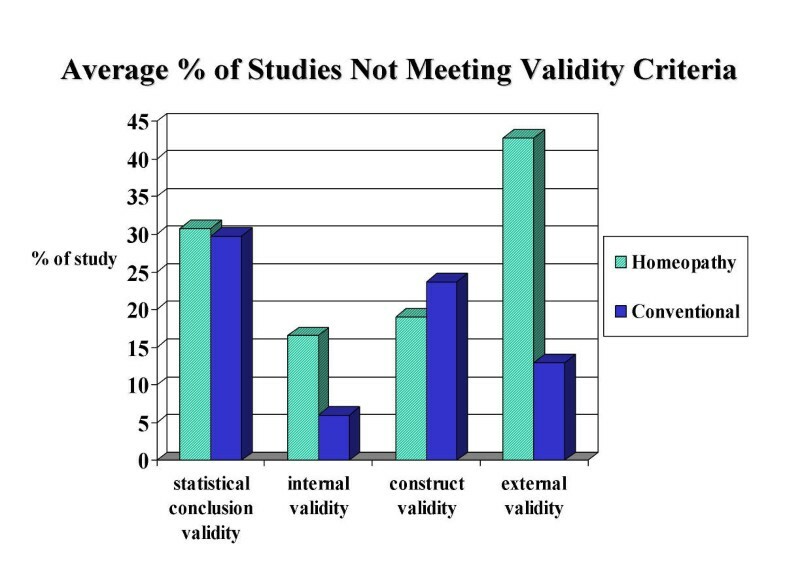 Percent of studies with specific threats to validity of homeopathic and conventional interventions. No study reported the reliability of measures. Almost all studies failed to report response rates, that is, the number of patients screened compared to the number who entered the study (n = 57, 96.6%). Of the two studies that reported the proportion of subjects approached who participated, the average response rate was 36.5%. Nearly two thirds of studies (n = 38, 64.4%) did not report the attrition or drop-out rate. For those reporting this item, an average of 16.9% of subjects began the experiment but failed to complete it. A total of 229 outcome variables were identified, an average of about 4 outcomes per study. Of these, 62 (27%) were only descriptive and no attempt was made to determine how they were affected by the homeopathic treatment. Seventy-three variables (32%) were reported to have statistically significant improvement as a result of the treatment. Ninety outcome variables (39%) were unaffected by the treatment, while four variables (2%) were made significantly worse by the treatment. The probability of a positive outcome was significantly lower when random assignment was used than when random assignment was not used (chi square= 11.9, p < .001) a finding often found in study series and confirmed by others in homeopathic trials. However, when the homeopathic treatment was compared to a conventional medical treatment, the probability of a positive outcome was significantly higher than when a placebo control was used (chi square = 15.3, p < .0001). Significant threats to validity occurred in 30–40% of studies in every major category of validity measured. (Figure 1) Especially high were problems with external validity since most studies had small sample sizes and few were multi-centered. Thus, the results of research in homeopathic medicine is less likely to be generalizable beyond study populations than the results of research in conventional medicine. Surprisingly, internal validity quality scores were very similar between homeopathic and conventional studies, indicating that homeopathic research is not appreciably worse than conventional research when it comes to controlling for bias and systematic error. (Figure 1) Compared to conventional studies using these same quality criteria the homeopathic studies had a higher number of validity threats in 21 categories (63.6%), and the same in 7 (21%) categories. Conventional studies scored worse than homeopathic studies in 5 (15%) categories. How homeopathic and conventional studies compare on all validity threats is shown in Table 3. We were unable to do a subset analysis of conventional studies that used only parallel control groups in order to confirm the independence of validity threats from study design in this sample. The overall quality scores in homeopathic trials improved somewhat from 1945 to 1995. Cohort group summary scores went from 30% total validity threats in studies done prior to 1980 (n = 17), to 26% validity threats between 1980–1989 (n = 29) and 24% between 1990 and 1996 (n = 13) (NS). This review of clinical outcome research in homeopathy has several important implications for the field not revealed in other reviews. Despite the absence of funding, it appears that a number of prospective clinical trials using random assignment and control group designs have been accomplished. The results of these studies suggest that, in general, homeopathic treatments may offer some promise, particularly when compared to conventional medical treatments. As expected, the findings are less impressive when a placebo control and randomization are used. This pattern may reflect the placebo influences common to both conventional and homeopathic therapies and the possibility of selection bias in favor of homeopathy for many studies reported. Both of these factors would falsely elevate the number of positive studies reported in homeopathic research. On the other hand, homeopathic physicians spend considerably more time per visit with patients than conventional physicians. The comprehensive interview and long-term follow-up undertaken as part of homeopathic case management increases patient-doctor interaction and likely enhances expectancy and placebo effects. This may make it more difficult to detect and isolate any additional effects from homeopathic preparations, if these occur. Combined with small sample size this might falsely increase the number of negative studies reported. Thus, the effect of the homeopathic clinical process needs to be studied separately from the examination of any specific (non-placebo) effects that might occur from homeopathic drugs. The former should be examined in pragmatic randomized trials that compare homeopathic with standard therapy and the later should be examined using simple laboratory or clinical models that can be easily repeated by independent investigators. This study has several limitations. The samples of homeopathic and conventional studies were not identical. While we took all conditions in both study samples, we examined all the English language studies in homeopathy over five decades as opposed to more recent studies only in the conventional literature. In addition, we selected only studies with parallel control groups in homeopathy but took all intervention studies in conventional medicine. We did this in attempt to select a "gold standard" sample of research in each area. While this difference between samples should only have effected two of our 33 quality criteria we cannot be sure that other validity scoring were not effected. To assess the relevance of these sampling differences we examined only the more recent studies in homeopathy. Unfortunately we were unable to do a subset analysis of only conventional randomized, placebo controlled trials in our conventional subset in order to confirm the independence of validity threat from study design as previously shown. It is likely that this would have further improved the quality scores of the conventional subset, however, which would not affect our main conclusions about the general quality of research and threats to validity in these two systems. A second limitation is that the Systematic Review method used in this evaluation is derived from the social and behavioral sciences and is not commonly used in medical research evaluation. We selected this system, however, precisely because it was broad enough to examine disparate theoretical systems in a more even handed manner than review criteria developed specifically for use in a biomedical framework. While the SR method has been used in conventional and complementary medicine evaluations in the past we realize that the system can only help make general estimates of comparative quality and that individual or summary scores between the two systems should not be viewed as precise. Since limitations in score precision is a problem with all such scoring methods we have tried to highlight only the general and obvious validity threats found. Currently, the greatest weaknesses in homeopathic research are the variety of unreplicated studies and the small sample sizes. Although 59 studies were included, there was virtually no replication and practically no overlap in the conditions studied. Two thirds of the studies had total sample sizes below 100 and many did not do power calculations to determine the required subject numbers. In order to build credibility within the medical research field, multiple replications and/or extensions using the same or similar approaches to treat the same or similar medical conditions are necessary. Similarly, multi-site research with larger sample sizes is essential to improve the confidence and generalizability of findings. As in all of medicine, success in a treatment at one site often does not always translate into success at other locations with different practitioners and patients. A second major flaw of homeopathic studies in many have a high "attrition rate." This means that the data analyzed and reported on is often lower than the entry sample size due to all causes, such as dropouts, lost or incorrectly filled out forms, etc. A high attrition rate can be a major threat to validity in a study. In addition, homeopathic studies often demonstrated a interaction of treatment setting and treatment indicating that non-specific effects in the environment more often contributed to the outcome than in conventional research. Finally, several fairly simple improvements in the reporting of research findings can help to heighten the quality of these studies. Most importantly, an outlined discussion of study limitations and potential confounders is important for a balanced interpretation of results and for the advancement of existing research. Similarly, a detailed description of sample characteristics, including gender, ethnicity, and attrition rates is necessary for determining generalizability. By precisely delineating study and sample characteristics, research findings can be stated more definitively. The absence of an appropriate framework from which to examine homeopathic remedies is one but not the sole challenge to quality research in this alternative practice. Critical systematic review of these studies identifies a number of areas for improvement. Quality guidelines for conducting research in homeopathy are published. More critical peer review of homeopathic studies that pay attention to these and other guidelines can advance quality research in this area. Such criteria need to be carefully addressed by investigators if the quality, credibility and usefulness of research in homeopathy is to improve. The authors would like to thank Michelle Shasha for participating in the review of the homeopathic clinical trial articles. This project has been partially supported by a grant, the Standard Homeopathic Foundation and NIH, NCCAM grant, #AT00178-01.